Other pie/apron projects: January Pie: Lemon Meringue, February Pie: Milk Chocolate Pudding, March Pie: Thin Mint Grasshopper, Recipe-A-Day Week Vol. IV Day 7: Quakertown Crumb Pie (April). Holy fruit season, Batman. This was so good, I’m still a little thunderstruck. I had a strawberry allergy as a kid, so I never ate strawberries and eventually lost a taste for them. I kind of haphazardly avoid them, thinking they’re too tart on their own, too syrupy and unpleasant in dishes. 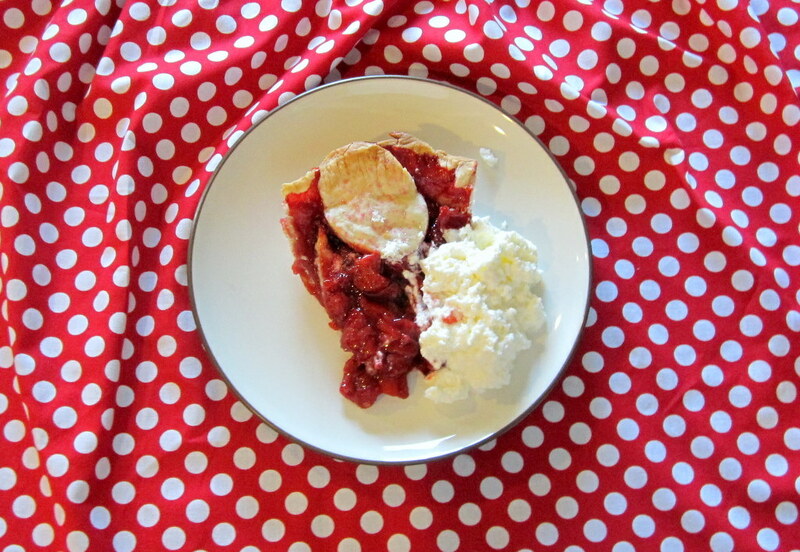 But Adam loves them, and I knew I wanted to make a strawberry pie as part of my pie-a-month project this year. And I was going to make it next month (I’d read June is strawberry season), but the local farms and markets nearby already have a bumper crop of gorgeous looking fruit. 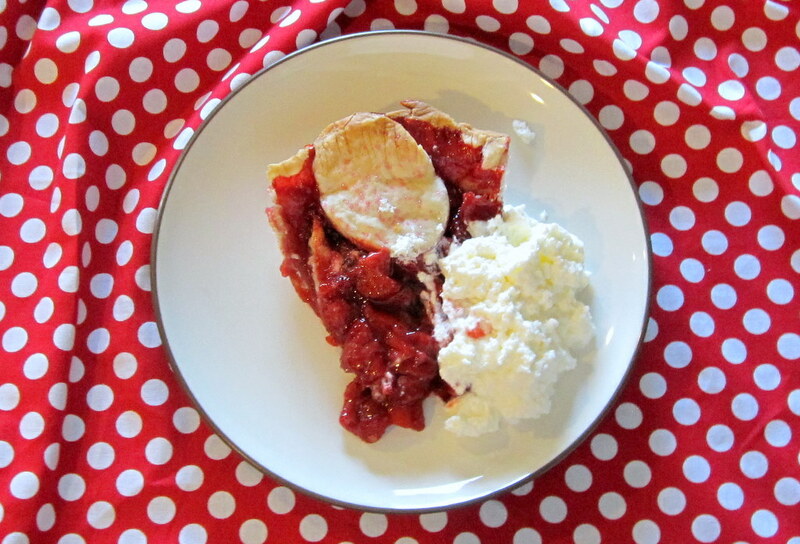 So since it’s Memorial Day Weekend, I broke down and bought 2 bushels of pesticide-free, glorious looking strawberries and made the pie for our cookout today. I used a recipe from The Neelys for the pie, which was so easy I cannot stand how many fruit pie variations I will be making this summer. 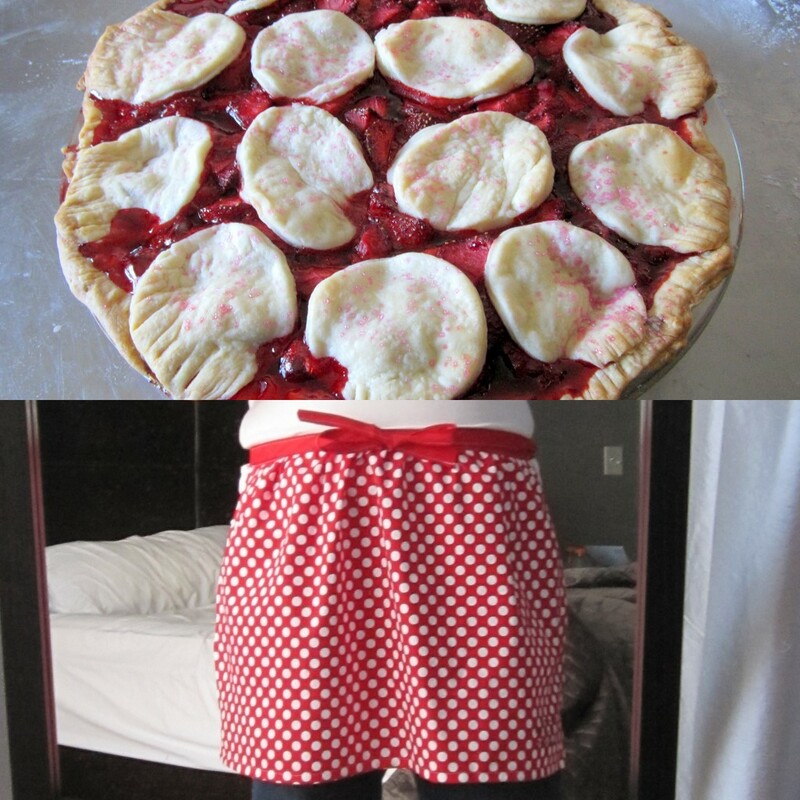 I suddenly understand pie in the summer. 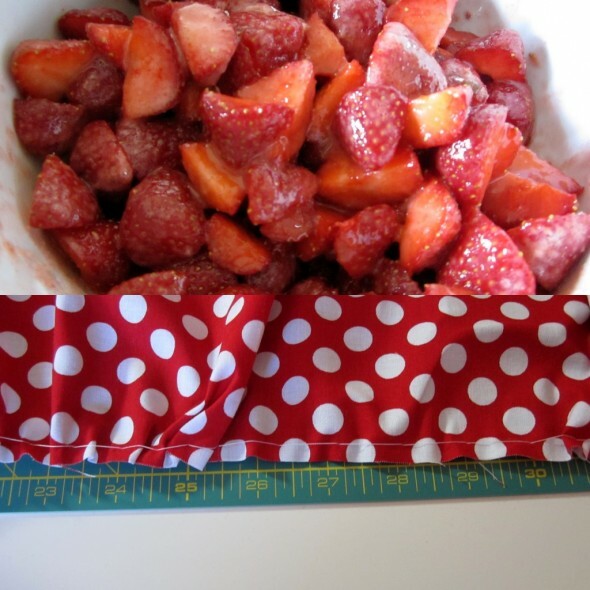 And the half cafe apron is something I just whipped up in less than an hour with some fun red Michael Miller polka dots. 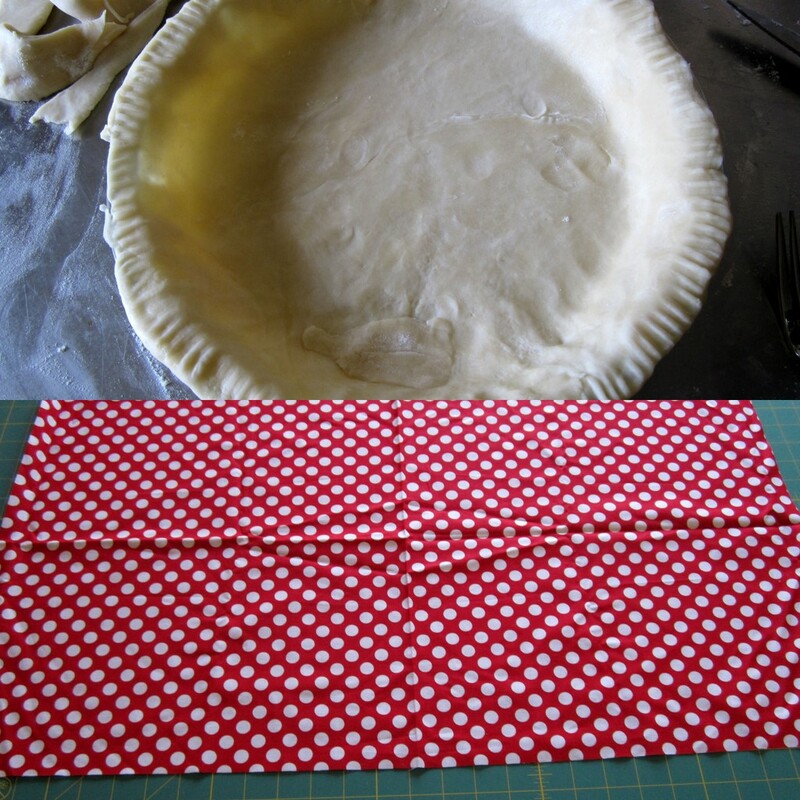 For the pie: Preheat the oven to 400 degrees F. Roll out 1 sheet of the pie crust and put in a 9-inch pie plate, crimping the edges for a pretty presentation. 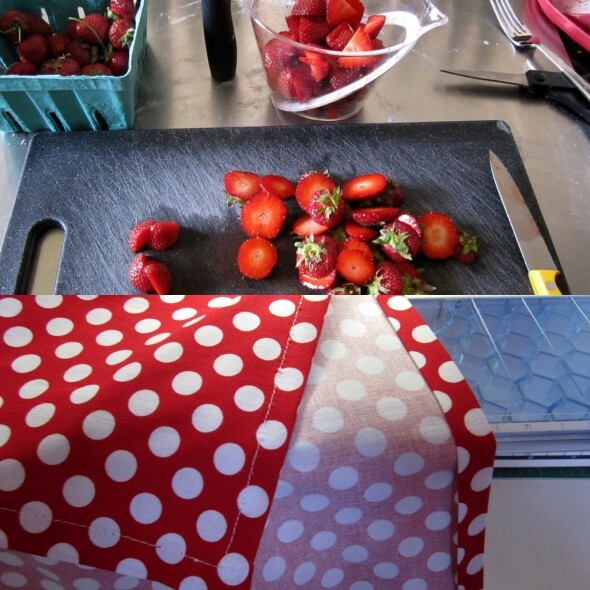 For the apron: Cut the 1/2 yard of fabric into a 30″ wide x 17.5″ long rectangle. 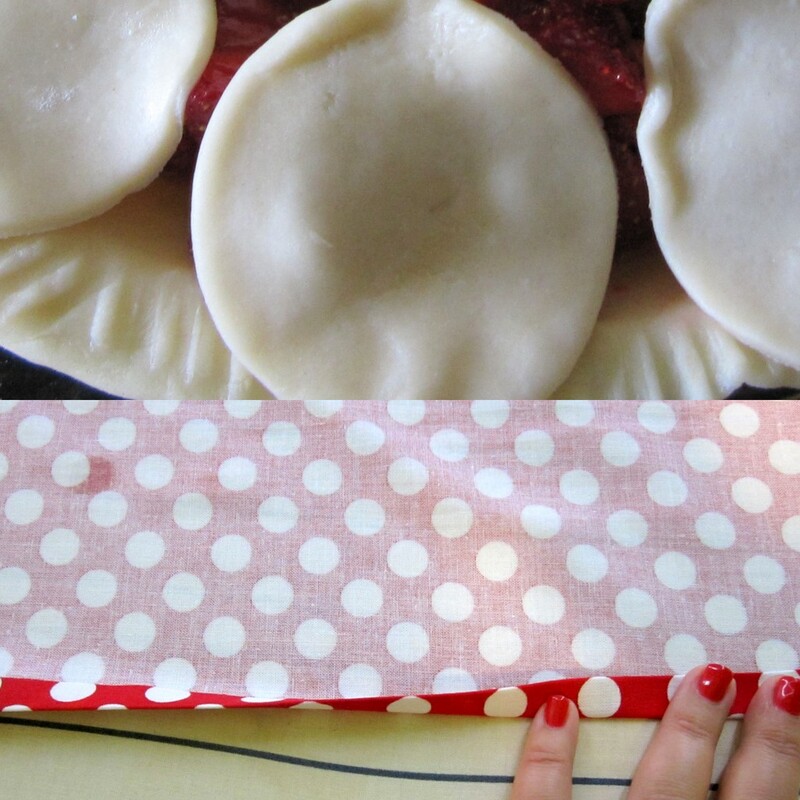 For the pie: Roll out the other sheet and cut into 1/2-inch thick strips with a sharp knife or pastry wheel. For a fancier crust, use a 1 to 1 1/2-inch circular cookie cutter and cut out circles (this is what I did). Set aside. For the apron: Leave the top of the apron untouched (one of the 30″ sides). For all other sides, fold the fabric in 1/2″ and press. Fold in another 1/2″ and press. For the pie: Wash the strawberries. 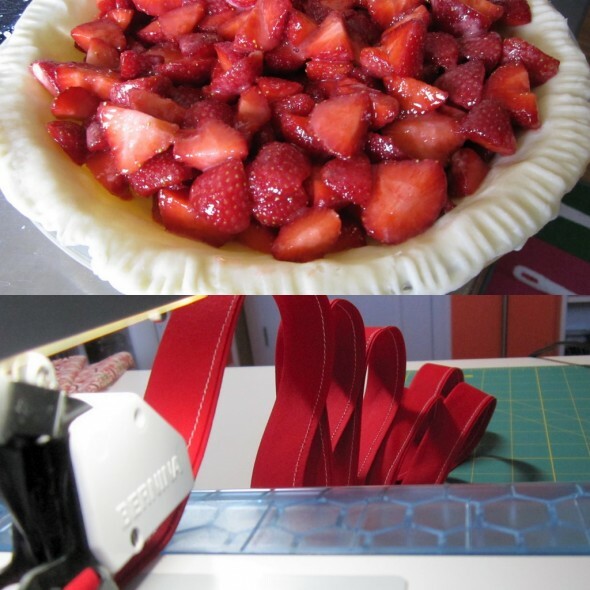 Cut off the strawberry stems and cut the strawberries in half. For the apron: Top stitch all around the hem of the apron, leaving the top untouched. For the pie: In a medium bowl, mix together all of the filling ingredients (strawberries, granulated sugar, cornstarch, salt). For the apron: Baste along the top edge of the apron, leaving long thread tales at either end. Pull the thread to gather in the fabric at the top of the apron until you reach your desired width for the apron. For the pie: Pour the filling into the crust. For the apron: Edge stitch the entire length of the bias tape closed, making one long continuous strap. For the pie: Arrange the strips over the top of the pie in a lattice pattern, tucking in the edges, OR layer the circular shapes on top of the strawberries. Brush the top with the melted butter and sprinkle with the sanding sugar. For the apron: Attach the bias tape to the apron. Fold the bias tape in half, find the middle point, then pin the middle point of the bias tape to the middle point of the gathered edge of the apron. Pin the bias tape in place along the top of the apron, making sure the gathered edge is covered. Topstitch in place. For the pie: Bake the pie for 25 minutes and then reduce the temperature to 350 degrees F. and bake until the top is golden brown, another 30 minutes. Let cool before serving with whipped cream, if desired. 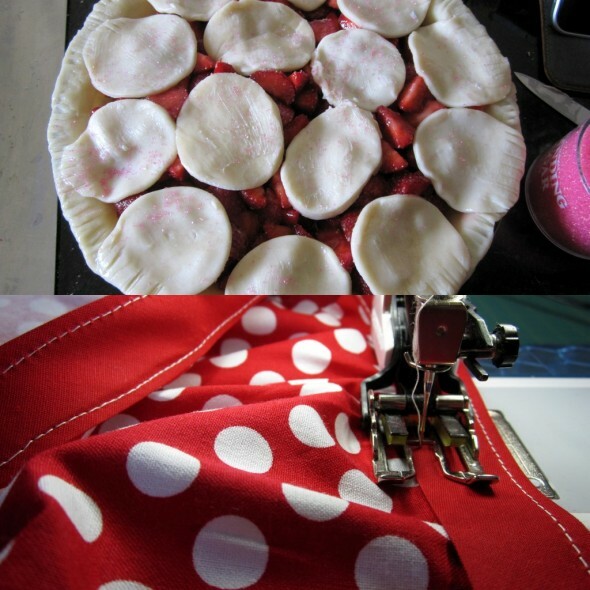 For the apron: Clip any loose threads and try it on.